Whether you are in charge of an organization, a department, a team or a project, one of the most important things successful leaders must do is accept responsibility. You will rely heavily on your team to get things done, to be sure, and you will need to stay open to others’ ideas since – believe it or not – they frequently will be better than yours. And yes, there are always unexpected bumps in the road that are totally out of your control. But if you are to be an effective leader you need to start and finish with the premise that the one thing you carry above all is ultimate responsibility. 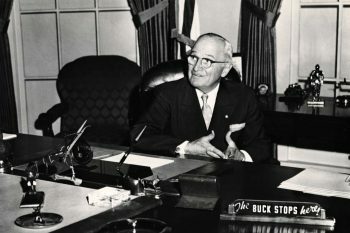 Harry S. Truman, 33rd President of the United States of America, with his iconic “The Buck Stops Here” desk sign. If he can accept responsibility, so can you. This simple lesson can be as hard to internalize as it is easy to say. As leaders and managers we facilitate and orchestrate with the big picture in mind. If a piece of our plan falls out of whack, we are the ones with the perspective and power to creatively deploy a compensatory measure to make up for it. We are headed for trouble if we adopt attitudes like: “This would have worked out perfectly if so-and-so were better at her job”; or “it was the consultant’s fault.” There are no perfect employees, no perfect board members or volunteers, no perfect consultants, not even perfect machines. As a leader, it is your job to keep an eye on the big picture – the buck stops with you. Last summer I had the pleasure of taking a course in Economics as it relates to the philanthropic and economic sector (at the Lilly Family School of Philanthropy at Indiana University). Like many in our field, my background is on the programmatic side and my orientation is more intuitive than analytical. Over many years as a nonprofit manager and leader I have developed financial literacy and some degree of expertise, but only as a means to an end. I have had little exposure to the field of economics per se, and little to do with those who study and practice this fascinating subject (at least professionally – I do have some charmingly nerdy friends who are economists, people whose work life never seemed to connect with mine). I’ve always thought of economics as something in the cerebral, mathematical, scientific arena. I never appreciated the vital role its principles can play in increasing nonprofit impact. My study this summer opened my eyes to see economics with a very new perspective, one I think many nonprofit leaders and managers would benefit from. Working from the somewhat dated but surprisingly readable text, Economics for Nonprofit Managers, by Dennis R. Young and Richard Steinberg, I came to see economics as a “behavioral science,” a “decision science” and a “moral science.” Economics can help describe and explain the way individuals and organizations act. It can help us make wise decisions about allocation of resources. Economics can help us clarify and refine values and develop theories of change to help us fix serious social, societal and environmental problems. The complex formulas and graphic functions that used to baffle me are simply representations of anticipated human behavior. By taking what we know about individual and group psychology and translating it into formulas, we then have a means by which to evaluate different courses of action objectively and see how they might work in service of or against our organizations’ missions. We strip away the messy details and attempt to predict outcomes of various choices quantitatively. Of course economic analysis is imperfect as a predictor, and only one tool for decision-making, but it can serve as an important counterweight to our sector’s rampant overreliance on intuition and over emphasis on nuanced sensitivities. As a group, nonprofit leaders suffer from a uniqueness epidemic. We frequently fall into the trap of thinking that our particular situation is completely different from anything else in the world. But in reality stripping the details out of a circumstance in order to make a more analytical decision is not such a bad idea. Our refusal to consider the possibility that maybe our organization is not so different often leads to wasted resources and diminished impact. Three prevalent characteristics of nonprofit organizations and nonprofit leaders contribute to this problem. First is passion. We are who we are as a sector because of our incredible passion for making real, meaningful, lasting change. This is the engine that drives us and we could not survive without it. But sometimes our incredible zeal blinds us. As a wise person said to me recently “it’s hard to see a picture when you’re standing in the frame.” The set of tools that economic analysis provides would lend some much needed objectivity to our decision making. Second is hubris. By definition the nonprofit sector gives private actors that opportunity to express their beliefs about major societal issues and take direct action based on those beliefs. Engagement in our work depends on a conviction that we are right about the change we seek, and that our approach to making that change is the best way. Think about how much confidence it takes to build organizations that actualize our vision, not to mention convincing others to invest their hard earned resources. Let’s face it, this kind of certainty comes with risk of a certain measure of arrogance. Why waste time seeking objective analysis when we already think we know the truth. Economic analysis can provide a reality check on what we think we know. Even minor modifications to our assumptions or methods could dramatically change outcomes. Third is collaborative decision-making. The most sustainable nonprofit organizations have strong leaders, but they also have a deep well of committed constituents that participate in decision-making. This includes boards of directors, other volunteers, staff members and other stakeholders. Collaborative decision-making is a critical tool, but sometimes we over idealize it and overuse or misuse it. Arriving at good group decisions takes a long time, and lots of trial and error. It also involves an unendingly complex mixture of human emotions and interrelationships. When the process becomes a game of “the strongest personality wins,” stupidity often prevails. Economic analysis provides a way of bringing calming pillars of sanity to turbulent deliberations. I want to thank my fellow classmates from this summer, and especially our professor, Dr. Patrick Rooney, for giving me literally dozens of ideas for applying economic principles to the nonprofit and philanthropic sector. If you have not been initiated, I encourage you to spend some time getting to know the fundamentals of economic analysis. It’s a lot more practical — and applicable — than you may think.